Is There Really a Lost City of Atlantis? The myth dates back to 360 B.C, and was originally a story told by the Greek philosopher, Plato. Plato stated that the founders of Atlantis were half human and half god, also commonly known as demigod. It is said that the founders created a modern and perfect civilization and established great naval power as the city was made up of concentric islands (islands sharing the same center and have bigger rings of land surrounding the smaller ones) that were separated by moats and linked by a canal leading to the center. It is also said that the city contained lots of silver, gold, other precious metals, and exotic wildlife. Plato said that Atlantis existed around 9,000 years before his own time, and that the story of the city was passed down from poets and priests among many others. However, Plato’s writings of Atlantis are the only known records of its existence. There are many theories and debates surrounding the location of the city. Some believe that it is in the Mediterranean, off the coast of Spain, or even under what is now known as Antarctica. Lots of the city’s details are under speculation, and because of this, only a few scientists believe in Atlantis being real. The National Geographic ocean explorer Robert Ballard, who discovered the wreck of the Titanic in 1985, pointed out that nobody ever backed up Plato’s story or said that it was true. Despite this, Ballard admits that the existence of Atlantis is logical considering the history of catastrophic natural disasters like floods or volcanic explosions during ancient times. One of these natural disasters has a similar story to Atlantis’s alleged destruction. About 3,600 years ago, there was a devastating volcanic eruption near the Greek island of Thera, now known as Santorini, located in the Aegean Sea. The island was populated with civilians called Minoans, who disappeared suddenly after the disaster. Many believe that Atlantis was Thera, but there is evidence to suggest otherwise. The time that Thera was hit does not match up with the time of Atlantis’s destruction in Plato’s story. Considering this, others believe that Plato made Atlantis up to teach some philosophical ideas. It is known that Plato was dealing with many issues whose themes ran throughout his work. He thought about things like idealistic societies, divine versus human nature, and the inevitable corruption of the human species, so it is theorized that Atlantis was a fictional platform for Plato to convey those ideas. Many see Atlantis as a legend to teach people to be as humble as possible or even to just be content with what you have, as the story is based on moral and spiritual people who had the privilege of living in a modern city for its time. Unfortunately, these people became amoral, as they grew their army and conquered as far as Africa and Europe, infatuated with the idea of building their empire to be the strongest so they rule as much land as they could, which resulted in angering the gods because the people had lost their way or moral pursuits. As punishment, the gods sent fire and earthquakes down on the city, ultimately causing the mighty Atlantis to sink into the sea. The style of Plato’s story makes it easy to believe that all Atlantis is is a children’s moral education story, but there are some theories of Atlantis existing in certain places. One of the most popular hypotheses of the city’s location is near Morocco. A German computer expert named Michael Hübner used clues from two of Plato’s dialogues where Atlantis is mentioned, Timaeus and Critias. Hübner set up many different computer simulations, including something called a “Hierarchical Constraint Satisfaction,” and came up with an area on the map which was within 3,000 miles of Athens, Greece, which happened to be where Plato was from. Since Atlantis was said to be at war with Athens, Hübner plugged in the clues from the dialogues to pinpoint locations of battleships and stations, ultimately getting a rough idea of the city’s location. He theorizes that Atlantis is a little south of Casablanca, Morocco. While the idea of Atlantis being Thera was previously pushed aside, there are some archaeological evidence to suggest that it may be one of the city’s possible locations. Plato mentioned in his descriptions of Atlantis that the layout of the city was in concentric islands, and Thera currently (Santorini) has a bull’s-eye shape with a ring around its center, and has a relatively new volcano which is known to have erupted in ancient times. The island also has an important maritime city called Akrotiri which was discovered in 1967, and there is evidence showing that there was also a thriving naval center. The last main theory of the city’s whereabouts was formed when The Bermuda Triangle gained popularity within the modern world, and many began to speculate that Atlantis was a part of it, which makes sense considering that The Triangle is known to cause mysterious disappearances of ships, planes, and people. Man-made walls and structures were also found off of the coast Bimini, an island in The Bahamas, which supports this theory. However, the idea was quickly shot down when scientists revealed that the buildings thought to be the remains of Atlantis were simply natural beach-rock formations. 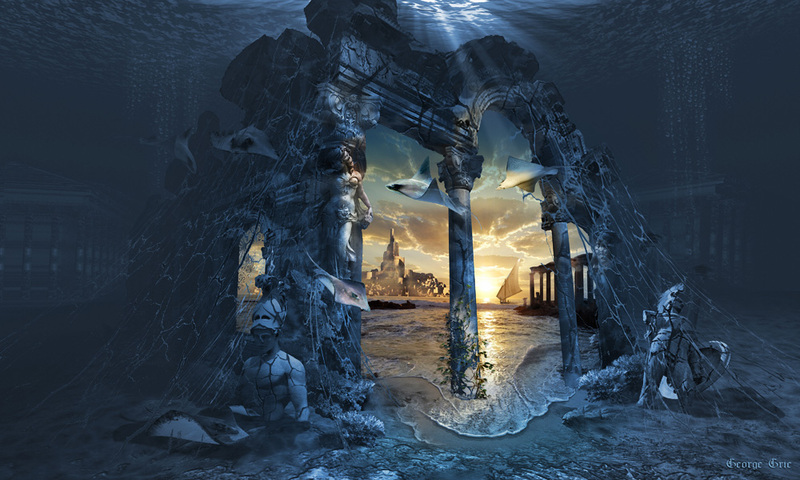 While there is a lot of information on Atlantis, almost all of it is made up of theories and inferences. When looking at Plato’s original work, the city is described in great detail along with the story, but there is no solid evidence to suggest that the city is real. Even when looking at all of Atlantis’s potential locations, nothing archaeological or geological can be found when trying to trace back to the city, so, unfortunately, there is absolutely nothing proposing that Atlantis is anything but a story. This does not stop some scientists from still searching, however, who are hoping to uncover more clues of the city’s existence, but as of now, it is safe to say that Plato’s philosophical story was just that. Because of this, many are disappointed when they find that it is very nearly impossible that Atlantis is real, but it is important to keep in mind the message and lesson from the legend. The myth reminds people to keep away from selfishness and corruption and to stay humble in morals and values. This does not mean that we should rule out the existence of Atlantis entirely, however. If scientists manage to find concentric islands and Egyptian inscriptions describing a story identical to Plato’s in the future, who is to say that there isn’t really a lost city of Atlantis?